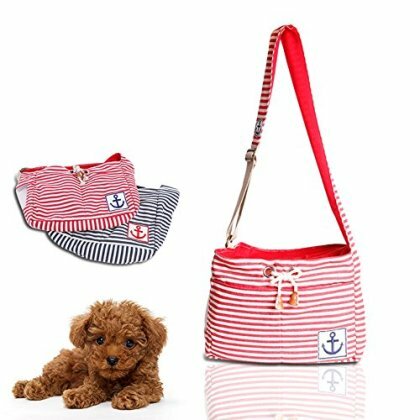 STYLISH STRIPED SAILOR THEME - This Amicute[Trademark] pet carrier bag features a stylish, striped sailor theme with an anchor patch sewn into the bottom corner and strap of the bag. Available color schemes are Blue & White and Red & White. HIGH QUALITY CONSTRUCTION - This pet carrier bag is made from high quality cotton and Dacron - includes a rope drawstring and adjustable shoulder strap. SAFE & COMFORTABLE FOR YOUR PET - Built with small pets in mind, this carrier sling offers the ultimate pet transportation solution. A leash hook is included on the inside so your pet is always fastened securely. MESH WINDOW & DRAWSTRING FLAP FOR BREATHABILITY - This pet carrier shoulder bag features a mesh screen that can be closed with the rope drawstring for breathability, as well a mesh window to ensure your pet always has fresh air. INCLUDES REMOVABLE CUSHION - For your pet's ultimate comfort, a soft cushion that fits perfectly inside the bag is included. This cushion is removable and can easily be washed - by machine or by hand.